Boutique wedding expertise is in high demand, and destinations are central to the event making a lasting impression. Desert Palm Per Aquum is building a reputation for delivering boutique wedding experiences through the expertise of a dedicated wedding planner coupled with the perfect backdrop for that special day. Be it a garden wedding or a grandiose decked-out indoor wedding, there is something extraordinary to be found in the 160-acre green estate. Only 15 minutes from Dubai’s urban heart, Desert Palm Per Aquum offers lush serenity, where stately lawns and polo fields extend toward the city skyline. 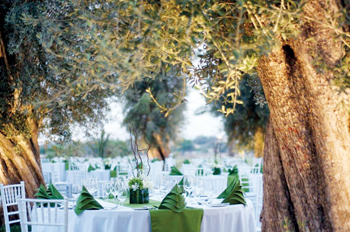 A stunning feature of the estate are the 300-year-old olive trees against the backdrop of the polo fields and the wide acres of fresh, green grass, with a capacity to accommodate 1,200 guests for a seated dinner. The hotel excels at hosting segregated female wedding parties with solely female staff, from waitresses and DJs to lighting experts.